Over the last decade the freight industry has changed dramatically. It is no longer acceptable to just deliver the freight as soon as it suits us, nor is it acceptable to only deliver on time “most of the time”. Customers now expect a much more reliable and transparent service. Retail customers in particular are reducing inventory to help reduce costs which in turn puts pressure on carriers and their ability to deliver goods just in time (JIT). Delivery in full and on time (DIFOT) ratings may now mean the point of difference when choosing a suitable carrier, and are equal to if not more important than costs in some cases. The ability to track and trace a consignment is now an industry standard and sign-on glass technology is almost commonplace in capital cities. Before long, it will indeed be the same in most major regional centres. As a large portion of regional Australia is now serviced by large freight agents and on-forwarders the expectation of a similar level of service and available technology is already here. As the freight transport industry continues to change and evolve, here at J&A Logistics Group we pride ourselves on being ahead of the curve when it comes to systems and customer service. An example of this has been the ability to provide our customers with electronic imaging of Proof of Delivery documents (PODs) since 2008. Based in Bendigo, the capability to service a sparsely populated area of Victoria as well as several regional centres in a timely fashion is testament to our dedicated employees and our large network of on-forwarding agents. However, the ability to know where every consignment is at any one time in such a diverse network is challenging to say the least. To help improve this we have invested heavily in technology and training to make this as easy for our customers as possible. Scanners, imagers, online customer and agent portals and a complete Freight Management System (FMS) have led to massive improvements in traceability and customer service. As 2014 progresses our customers will see a continued roll-out of this technology – making everyone’s lives a little easier. 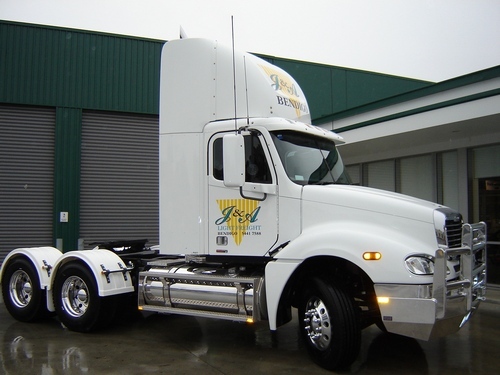 Please do not hesitate to contact us for enquiries regarding freight transport services in Bendigo and other regional centres of Victoria.